Situé dans un endroit calme et rural du lodge est lambrissé tout au long, joliment aménagées, entièrement à double vitrage et d'une propreté impeccable. Situé au cœur des Glenlivet / Cairngorms environ mi-chemin entre Aberdeen et Inverness Lodge est situé sur la célèbre Malt Whisky Trail avec de nombreuses distilleries ouvertes au public, y compris «The Glenlivet» qui peut être vu dans la distance de votre loge. A proximité sont nombreux châteaux, des maisons et des jardins qui sont ouverts au public, y compris le château de Ballindalloch probablement l'un des plus beau et romantique en Ecosse. Royal Deeside et Balmoral sont à seulement 45 minutes de la magnifique ville de Braemar, célèbre pour ses jeux des Highlands, quelques minutes plus loin. Sinon, l'emplacement tranquille fait de l'idéal 'obtenir loin de tout »avec sa position paisible faisant Glenlivet Lodge parfait pour tout simplement se détendre tranquillement. La décision est la vôtre avec des conseils et des brochures disponibles dans ce lodge familial privé. Pour nos clients européens, nous avons un compte bancaire européen donnant l'option supplémentaire et plus pratique de payer en euros. Salle de bains avec baignoire / douche, wc, lavabo et miroir. Notes sur l'hébergement: Chauffage électrique et électricité inclus dans le prix. Ne pas fumer dans la loge et pas d'animaux. À l'extérieur: Les portes-fenêtres glissent ouvert de la salle de séjour sur une véranda avec des sièges et une table donnant sur un grand jardin. Sur le site de stationnement pour deux voitures. Nettoyage / serviettes / /: Les serviettes et les draps sont inclus dans le coût. serviettes et draps supplémentaires situés dans la propriété. Propriété nettoyée sur le changement au fil des jours. We really enjoyed our stay. The lodge was clean, cosy, well equipped. The location was perfect for us : very quiet, in a beautiful scenery. And no midges ! Nous avons vraiment apprécié notre séjour. Le chalet est propre, chaleureux, bien équipé. La situation était parfaite pour nous : très calme, devant un beau paysage. Et pas de midges ! We are so glad you enjoyed your stay at our lodge and that you found it just as we advertise it. We use it regularly ourselves that way making sure it is always in first class condition. We really enjoyed our stay in this beautiful located lodge - it had all we needed and was cosy/warm in the snow. Norrie was very helpful and responded quickly when we had questions. We'd definitely stay again if/when we return to the area. Thanks Norrie and Eleanor. Thank you for choosing to stay at our Scottish lodge and we are delighted that you all enjoyed our highland getaway, we are so pleased that you found it comfortable and welcoming, especially with the heavy April snow that gives it even more of a special charm. We endeavour to create, and from your comments once again succeeded in providing, a spotlessly clean, cosy, warm and welcoming lodge that has all the facilities for our guests to spend their time in whatever way they choose whether that be energetic outdoor pursuits or to relax by sitting back, taking in the wonderful views by watching nature and the world go by, plus in the unlikely event of there being any queries re the lodge or the surrounding area we are more than happy to accommodate our guests needs. We would love to welcome you back and you would be more than welcome. Fantastic lodge with all you need! Comfortable and cosy! After spending six days in the lodge just after Christmas, we had an amazing time and the lodge was great! Norrie and Eleanor left a few gifts on arrival, which was nice and a Christmas tree too! The lodge had everything we needed for the family, lots of games and books and sky TV to keep us busy and really comfortable beds and living room. Norrie and Eleanor thought of everything, from plenty of towels, fully equipped kitchen, coffee machine and dishwasher and much more. It made our stay most enjoyable and relaxing. After days exploring the area, it was so nice to come back to a warm, cosy and very homely lodge! We can't wait to return and see the things we didn't have time to see. Thank you Phil for a lovely review we are so pleased you enjoyed our lodge and as you discovered there are so many hidden gems in the area that you need several visits to take them all in, we really do look forward to welcoming you back soon. Take care and here is wishing a very healthy and happy 2019 to you and all our guests. Hi Beverley, thank you so much for such a nice review and we are so glad you enjoyed yourselves, we totally agree with you regarding how special this area is as we continue to discover the magic and wonders of this wonderful this part of the world, and look forward to welcoming you back in the future to discover it yourselves again. Eine wunderschöne Lodge, die keine Wünsche offen lässt, und noch dazu in einer traumhafte Lage. Dort kann man wirklich Ruhe und Erholung finden. 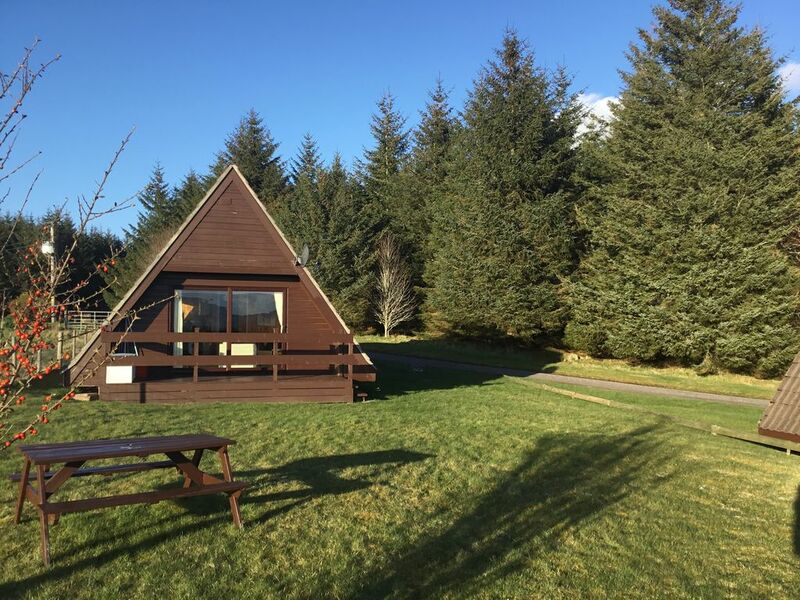 ‘A beautiful lodge that leaves nothing to be desired, and in a fantastic location. There you can really find peace and relaxation’. Thank you so much Susanne we loved having you stay at our Highland Lodge and as we have previously said we love it there and because we use it all the time ourselves we ensure it is always in tip top condition for our visitors. We look forward to you coming back again soon. `Amazing place, has it all to stop the time`. We are so glad you enjoyed our Highland Lodge which is located at the heart of the scotch whisky trail and the wild and wonderful surroundings of the Cairngorm National Park. We love it as it has everything so whether you want to just sit back, relax watching the wildlife and feeling like time has stopped or get out and wander the fantastic ancient hills and mountains, it is all there to discover and Maria we would love to have you back. L'aéroport: environ 60 minutes Inverness. Les aéroports d'Edimbourg et de Glasgow environ 4 heures de route. Utilisation d'une voiture est recommandée en raison de son emplacement rural. Duftown 9 miles, Tomintoul 12 miles, Grantown on Spey 20 miles, Aviemore 35 milles, 50 milles Inverness. Le Croft Inn Pub / restaurant 2 miles. Commerces les plus proches Dufftown. Informations touristiques disponibles en lodge.